Does cheek acne take a longer time to heal? Does cheek acne takes a longer time to heal? Help! I can’t get rid of the acne scars on my right cheek! They’ve been there for so long and while the evening primrose oil has helped to calm the inflammation and redness, the scars are still there! Although they have lightened up considerably with the use of rosehip oil which I’ve been applying daily, the healing process is slow and is driving me nuts! I certainly don’t remember acne or pimples on my forehead or chin taking such a long time to heal! Normally, the acne scars on my forehead or chin will heal in a week but this has taken weeks, or nearly a month now! Recommended ways to get rid of acne scarring include regular exfoliation such as using something containing salicylic acid, a beta-hydroxy acid, to help alleviate the appearance of red marks caused by acne breakouts. In the past, I tried using the Murad AHA/BHA cleanser for my chin acne and it did work well but this time I didn’t. Maybe I should go back to using it again. But I don’t understand why the skin on my cheeks don’t work the same way as the skin on my chin or my forehead. Because it is thicker? So I have learnt my lesson. I love to squeeze my zits but based on this experience, I am NOT ever going to touch acne on my cheeks anymore! In future, I’ll just apply evening primrose oil to calm it now that I know it works. I’ll definitely have less scarring issues to deal with that way. Anyway, I know the scarring will eventually be gone but it’s just taking longer than I wish for. Meanwhile, I’ll continue to use my Vitamin C serum, apply my rosehip oil diligently and try exfoliating with the Murad cleanser. And if anyone has other suggestions that have worked, do let me know. What helped clear my cheek acne? 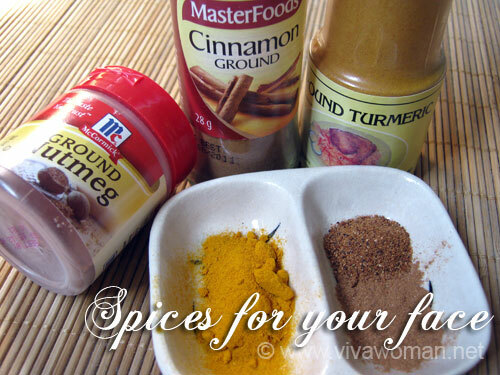 DIY Beauty: 3 spices to heal your post acne marks Nexcare Acne Patch is a savior for my big acne Does zinc benefit our skin & help prevent acne? Previous Post: « Applying foundation with sponge or brush? i have some annoying scars on my cheeks too!!! and i don’t take evening primrose oil, maybe now i should go get a bottle and then apply them on my face? p/s: the nose in the pic looks disturbing. lol. prettybeautiful: Hey, the EPO won’t get rid of the scarrings. It’ll help calm the inflammation though. Sad to say, it takes forever for the scars to lighten (not diminish) using Rosehip oil. What a co-incidence, I am also writing about acne today:) I so agree with you, cheek acne takes forever to heal but there are some natural ingredients that fasten up the healing process. My favorite is Vitamin E gel but I it might not be the right choice for people with oily skin as some people tend to break out with vitamin E Gel. 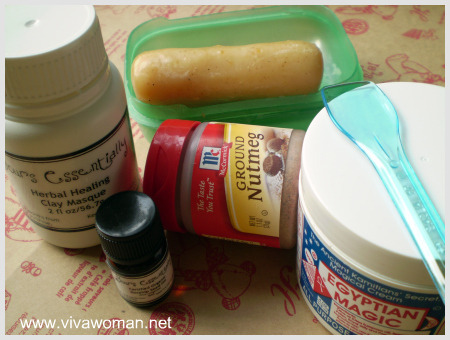 Second equally effective remedy is mixing Nutmeg powder with Honey and applying it on scars 2-3 times a day. Have you tried it? It really works. Leon: Vit E is too heavy for me…I don’t use it on my face. Never tried the nutmeg. I think of it as a spice…a reader said she tried using it and it burnt her face. Ya Vitamin E is very heavy. Nutmeg has to be used as a medication and only on acne not on the entire face. I guess she applied it like a normal facial mask. Leon: Ah, I see… for this nutmeg, do we get cosmetic grade? Thanks for this post. I’ve always wondered about acne on the cheek area as well because that’s where I tend to break out when stressed. I’ve also been faithfully using evening primrose oil but seeing not much result. I’ve heard of Palmer’s Skin Success Eventone Fade, actually bought but then… never used it. That does have the chemicals to actually fade scarring and discoloration over time (6 weeks they say) but because it’s not like the cream knows what you’re trying to fade, you have to apply it to the spot only or else the whole area will be faded over time, if that makes sense? Moosemousse: Okay, I think I know what you mean. It’ll be easier if you’re fair to begin I guess…otherwise you’ve got to be very careful in applying only to the spots. Hi there, I used to have lots of scars left behind by breakouts and what I found gave the best results in a short period of time was IPL sessions for the face. I was a skeptic at first and slightly unwilling to part with AUD250 a session. However, IPL is a miracle! Not only did my acne scars fade after one session, my broken capillaries disappeared as well. Plus my skin felt smoother and firmer. It was as though my skin went back in time. I am a total convert now. I have cut back on spending on expensive creams and cosmetics so that I can treat my skin to an IPL session now and then. JD: I’ve tried IPL for awhile and you’re right! My skin looked better especially my pores were less noticeable! The only problem I had was that I had to keep going at it and it’s draining financially especially cos I can’t resist not trying other products. And funny thing the derm I consult not too long ago didn’t want to do it for me. He suggested I used products which he found more cost effective. LOL. I definitely liked him for helping me save money! Hi, its my first time leaving a comment here although I read your blog occasionally. I do have acne on my cheeks and if I touch them, they will turn into bumps that take so long to heal and I regret touching them. I realised I do have some primrose oil at home so would like to try out since you said its so good. However, I’ve got a question. Does primrose oil actually lighten the scar or it flattens the bump? And is it possible to use it the next day if you can’t finish one whole capsule in one use? Thanks. Evening primrose oil is good to calm the redness, flatten the bump and prevent further breakout at the same spot. It doesn’t lighten…at least not that much. I always use it on the same day. If you keep it in the fridge for a day, it shouldn’t go rancid but I rather tell you to use it immediately. You can apply it to your neck and body. I also got a lot of pimples coming out from lower part of chick. Natalie: Hey, thanks for the advice about the AHA products. The one I use is a cleanser; not a leave on so potency is lesser I guess. But I don’t want to use too much of it either and I agree with you that it can cause irritation especially if the acne is still “raw”. YZ: Yup, I can feel the pain cos I’m going through that now. I don’t have clear complexion but this is causing a major blemish on my cheek! Very very annoying! Hi Sesame, you can use the normal Nutmeg which is used for cooking. 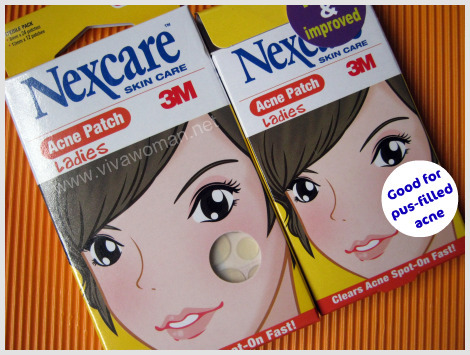 I used to have pimples during that time of the month, but now not anymore. Jan: Oh you’re so lucky. The products must suit your skin very well. Which brand is that? You are welcome Sesame:)Lemme know how it goes. Jan: Ah…I saw their products on ads. Sounds interesting! I have started to use primrose oil and my skin is improving. Does this help in acne scars? I have some very faint acne scars on my cheeks. I mean where the skin form pits. If not, do you have recommendations for acne scars? Thanks. Ling Lee: Evening Primrose Oil can help to improve but not eradicate the scars. Those faint acne scars, if are old will need a bit more work. Try Vitamin E but just note that it is very rich. You can also try AHA products (eg. Neostrata) but it’s not natural and you need to use sunscreen diligently if you use AHA. i find the chart pretty accurate! thanks! i started having really bad breakouts on my cheeks ever since i started work and had gastric problems. i’m trying to eat my meals regularly now, and breakouts have reduced! i’ve also been doing this light & peel thing at my derm, and have to say, it works in reducing breakouts and lighten scars! Daphne: That’s great! I’m glad you’ve got your breakouts under control now. hi!i am 12 yrs old going to 13.i really want to try the sample as i have lots nof pimples on my face!i have a really oily skin and blackheads since young.i believe that teens,girls or women wanted to have a crystal clear skin and i am one of them so pls i relly want to try the samples! Taran: Fresh aloe vera is good for healing! I’ve tried that and it works too. I recommend taking zinc tablets. Zinc is really good for skin healing. I’ve been taking a zinc tablet combined with a vitamin C tablet and i’ve noticed my skin is healing faster and the scars on my cheeks are fading quicker! Oh what a coincidence! I was just thinking about this the other day but I didn’t take any action to purchase the item. Hmm…I think I should go and check it out again. Thanks for sharing the info! What form of zinc are you taking? I was taking zinc citrate. I have an easily upset stomach and I was finding these put me in excrutiating pain. I know there are other forms too and I was wondering if switching would ease the stomach upset. I was taking a brand that was locally available…however, I’ve since discovered that probiotics supplements are better to help with the issue of acne caused by digestive issue. 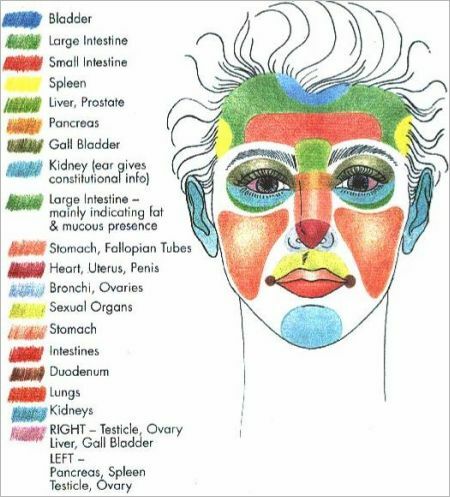 hmmm…the chart would be tough to read for colorblind ppl… and the side of the eyes are pink…for problems with ovaries etc…but acne can be developed at the side of the eyes??? Anyways, I find scrubs and skin renewal cream helps in lightening my scars on cheeks. I suppose the chart was also showing problematic areas but probably few people would develop acne there? hi thanks for the great article, i’ve been looking forward for this. i have persistent cheek acne on right side only, so once 1 acne is gone, come the other one nearby the previous spot which really drives me nuts. im currently using tea tree oil diluted with water and apply on my cheek acne,take zinc+vit C everyday, use non drying+comedogenic cleanser (cetaphil), toner etc. but it doesn’t help to prevent break out on my cheek. any suggestion? What about your diet? Do you take diary products? PMS will affect your chin more than your cheek from my understanding. uhm i do not take any dairy product as well.. do you have any suggestion what product is good for mild-acne and not too overdry? because the common anti-acne series too dry for me. You can try tea tree oil mix with aloe vera. It’s not drying. I took Kordel’s EPO for a while but stopped cos I was worried it could contribute more to my hormonal imbalance. You can read my entry if you’re interested to know more. i have stubborn cheek acne too.my mom took me to the dermatologist (because i had acne all over my face.) He gave me retin-A. It worked like a charm, but i have slight acne on my cheeks still. and they will not go away. On good days they will be very tiny little bumps. Be careful with your diet. 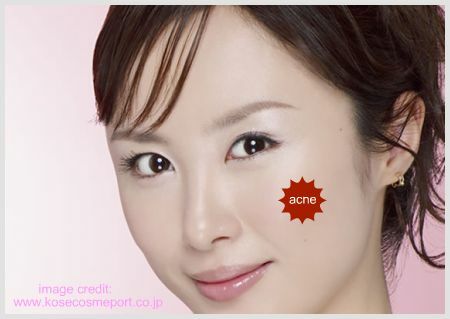 Cheek acne are usually due to intestinal issues. Cut down on diary products if you can. I have this small cluster of pimples on my cheek and I’ve had them for a 1 month. I thought I could just be careful with cleanser and at home treatment but it took forever to go away, so I decided to see a derm. He prescibed oral antiobiotics and I’m taking them now, I just want these ugly things to go away!! They do seem to be getting better but even when I put makeup over them you can still tell although they are decreasing in size. Ughhh, I’d like to wait until they’re gone so I can start exfoliating, etc…. I’m 53 yrs old and have had acne all my life since I was 14. Now it’s mostly on my right cheek. And like everyone is saying, they take forever to heal. I’ve tried everything, but I’m thinking it’s coming from the inside (intestinal, hormonal or something). I’ve been to dermotologists, no treatment was permanent. I was using Salicylic acid and Glycolic acid 7% for the last couple of months and that was really working good . My skin was looking so bright, fresh and smooth. The old scars and discolorations evened out somewhat. Now, this week, I’ve got four new huge cystic-like bumps on my nice fresh cheek skin… It’s starting all over again! When is this going to stop already! Try taking probiotics and cut down on refined sugar and diary products if you take these stuff. Thank you for reminding me about that! As a matter of fact, lately I have been having candy “cravings” and was eating a lot of sugary candy, which I don’t normally do. And I started eating a snack product with eggs in it. Eggs used to really make me break out for some reason. I stopped and the acne abated. Whoever says diet doesn’t have anything to do with it is wrong! Yes, and the probiotics is a good idea too. Thank you very much…even an old timer needs these reminders now and then. You get lax and forget. which salicylic and glycolic acid were you using. I’ve heard good things about them and I want to try one but the market can seem so overwhelming with so many bad ones to choose! Hi, I’ve been using Paula’s Choice 2% BHA Salicylic Acid lotion, and find it really gets rid of dry flakes. I only need to use it once a week or so. The Glycolic acid I got was from an Esthetician and it’s made by Tropical Rx and called Skin Resurfacing 7% glycolic and lactic acid. I would not recommend to go higher than 7%, because when you first use it,it stings and can burn your face. As soon as you feel it starting to tingle, you’re supposed to wash it off with water. The next day, I notice a little flaking, which is normal, but nothing like a strong peel. But wow, a couple of days later, my skin really glows and is satiny! Also, Sesame, I want to thank you for your advice last month! I stopped eating dairy (eggs) and sugar(candy!) and started taking probiotic yogurt (Activia) and my skin has calmed down again! Thanks! And maryssa, good luck, just don’t use a strong product to start out with. Don’t let them talk you into that. It’s not really needed. I only use the glycolic and salicylic acids once a week, if that. Just to get back the glow and get rid of the flakey dry skin areas that cleaning doesn’t take care of. (These acids really take care of blackheads and large dark pores! -great invention!). I am 24 and have the same issues. I’m afraid it is intestinal. It MUST be my internal health, but I don’t know what. Have you researched fungal acne? I looked into that, but wasn’t sure the symptoms were accurate. It’s an easy cause to overlook, though. The woman who does my facials scolded me when I went in with several large bulbous cysts that were all deep and on my cheeks. She lectured me on my internal health and said that if I committed to drinking half a gallon of water a day plus start taking a Probiotic vitamin every day (a kind of multivit) that I’d see results in 2 months. I haven’t been religious about it, but have been doing better about water. Maybe an intense detox for intestines and colon would be helpful. I’ve often thought of that. Good luck, I’m so ready to have my self-esteem back. You’re not alone! I just happened upon this site, while deliriousley trying to find a an answer to my crazy break-outs. I’m 46, and going through the perimenopausal portion of my life, and have had break outs, actually, I sisn’t start my breakouts until I was about 24. But this past weekend, I broke out with two patches of acne on my right lower cheek, just right of my mout and another smaller one just right of my right nostril, I also have 2 huge cystic acne bumps on my left, one on my cheek and one on my jawline which I’ve had for about 2 weeks.Finally a small bump right in between my eyebrows.I’ve NEVER broken out in patches before, and this sudden break-out really has me concerned. I did the unspeakable last night and popped the cycstic bumps on my left, because they would NOT go away. It was my last resort! I felt like a leper, I’m embarrassed to let my husband look me in the face or anyone else for that matter. I am in dire straights here. Any help would be appreciated. How’s your diet like Teri? Are you moving your bowels regularly? I ask because I broke out around the same places you described and I’m just slightly younger than you are. At first I thought it was hormonal changes and later I found that it has something to do with my digestive system. I did a 2-week detox and then started taking probiotics daily. I don’t breakout now except with wrong products I use. Read these entries – perhaps they will help you. Yeah, try to look at improvements from your internal system first. It should help. what do you mean stomach problems :O ! Is there anything specific? As in no being able to visit the toilet regularly? Oh my goodness. This is so true. 7 months ago, I started getting these weird abdominal pains and there started to be tons of clogged pores on my cheeks. Just this week, I went to a doctor, and she diagnosed it as a bacterial problem, and gave me this medicine that would make my stomach acid less acidic (also used to heal stomach ulcers), and my mom mentioned to me that my stomach problem probably caused my cheek acne! & now that I see this, I have so much hope that my cheeks will clear up soon (and I can stop using retin A)!! One of the happiest moments ever. You can try using products containing vitamin C to improve the texture. Anything you recommend specifically? Will it fade up my scars? Fading takes time…one way is to use a yogurt mask daily for a period of time. Yogurt with what? Like natural white plain yogurt? WOW! This chart is awesome. I have noticed that recently, I’ve stopped drinking my morning protein shakes and I have been breaking out a lot in my cheeks, I guess due to lack of vitamins and proteins in the morning. Also, I’ve never tried the primrose oil, I’ll have to give that a try. But, I do use lemon juice nightly and that seems to help dry out pimples and prevent breakouts. It stings for a few seconds, but it totally works! Ali last post is: Share: do you do anything when you’re using a mask? The primrose oil is helpful to soothe the inflammation when you apply topically on your breakout spots. For acne scars the best thing to do is a lactic chemical peel. Lactic helps fade the acne marks. The red pigment takes time to fade because its deep under the skin. An esthetician or Dermatologist could apply the peel. The MAGICAL solution that no one ever knows about or talks about: hydroquinone!!! It will give you AMAZING perfectly even toned skin in a matter of weeks. I swear. The BEST line is called Obagi. I speak from personal experience and have even dealt with melasma which is brown spots from the sun. My dermatologist is Dr. Brandt himself and I have access to the best skin products in the world. For fastest results use it in combination with tretinoin/retin-a.